March 19, 2019 – The field of philanthropy is going through a period of rapid change: Individuals from across the globe are embracing philanthropic giving at ever-younger ages. New ways of giving—from spend-down philanthropy to donor-advised funds are emerging. At the same time, philanthropic organizations can be faced with the same obstacles as big businesses, from a large field of competitors to a lack of trust. Philanthropies can no longer take donations for granted. Instead, they must generate trust and both articulate and demonstrate the value they add to the world of giving to donors who are increasingly demanding accountability. The old philanthropic model can no longer address this ever-changing environment. successful, businesses must examine their underlying assumptions. The Philanthropy Framework gives philanthropies a vehicle for a deep analysis of their organization at three levels: its charter or origin story; its social compact, which must clearly identify the organization’s value to society along several dimensions including accountability and transparency; and, finally, its operating model: that structure which best allows the agency to delivery on its social compact. Philanthropic Framework provides a vehicle for organization self-analysis and allows for the adoption of new ideas that will help steer both new and existing agencies into the future. Not only will the Philanthropic Framework help organizations arrive at a better understanding of themselves in terms of purpose, values and intent, it will also allow a means of communicating and demonstrating those values in a clear and concise manner to those within and without the organization—from board members and staff to current and potential investors. 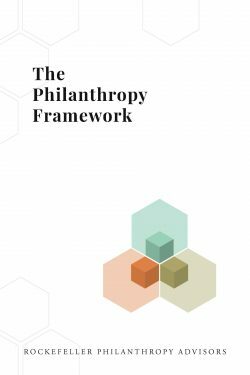 The Philanthropic Framework offers a new model, one that helps organizations address the challenges and opportunities in philanthropy today—and in the future. If you are interested in learning more about The Philanthropy Framework and hearing from foundations that have used it, please join us for a webinar on March 27, 2019 and check out The Chronicle of Philanthropy’s article on The Philanthropy Framework.